We are trying to plan a trip to Banff and Jasper National Parks. Any hints or suggestions on where to stay and what to do? Any easy to intermediate hike suggestions? A couple of years ago, I drove from Montana into British Columbia and crossed through Kootenay National Park into Banff. 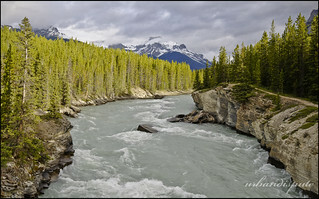 From Banff, I drove as far north as the Abasthca Glacier but did not make it to Jasper. It was all an incredible area with gorgeous scenery. There's a really great visitor center in the town of Banff for getting permits and hike ideas. Since it was June and a lot of the trails were still snow covered, someone at the visitor center recommended hiking to Glacier Lake. The trailhead is several miles north of the town. I think it was about a six mile hike to Glacier Lake. At the lake, there is a camping area where they have a neat food hanging cable system to defeat grizzly bears. I camped at the lake and hiked back to the car the next day. Moraine was still ice covered the week before, I believe. It was a lot of fun just driving up and down the Icefields Parkway, actually. I could have easily spent weeks in the area but only had a couple of days. Edited 2 time(s). Last edit at 01/27/2013 08:28AM by bbb. Thanks bbb. I am also looking for some short hikes for me, I have a bad knee and on a good day can only do a 5-6 mile round trip, less on other days, with little elevation changes. There are some interesting features around Jasper that require very little hiking to see. I was traveling with (basically) non-hikers so we usually took the shortest route through each one, but we had the option of going farther if we'd wanted to. Athabasca Falls and Maligne Canyon come to mind. There's also an aerial tramway up one of the nearby mountains and you can look down on the town of Jasper from the top. We went in June 2011 when there were still patches of snow at higher elevations. We even had to cross a little packed snow to get to the summit (which reminded me a little of Sentinel Dome). The Canadian Rockies are made of rather dark rock (slate and such) so with snow on them, they end up looking black and white. My friends thought Banff would be too upscale for us so we stuck to Jasper. How do you say hello in Canadian? "Hello. Bonjour." Edited 1 time(s). Last edit at 01/27/2013 03:53PM by gophersnake. I'm planning a trip to Banff, Jasper, and the area for this summer. Any additional thoughts? Recommended laces to stay? Day hikes? We will be taking a hiking tour for part of our trip. Any other forum(s) that would have more info? Re where to stay -- my friends rented a cabin near Jasper for a few nights. It worked out pretty cheap per person per night compared to, say, Yosemite Lodge. I don't know anything about Canadian hostels but the HI-Canada map shows that there are almost as many HI hostels (13) on the Alberta side of the Canadian Rockies alone as in all of California (15). How are you getting there? I don't know if I'll ever get a chance to do it but I've heard that the train ride from Vancouver to Jasper is spectacular. We are planning to fly into Calgary. We would love to take the train but don't have enough time with my son's competitive marching band practice this summer and it would cost more money. We also had thought about driving to Glacier NP and Waterton and then on up to Baniff and Jasper but time and money is again an issue. It is a big birthday year for me and our 25th anniversary so we are going to splurge and want to stay one or two nights at the Fairmont Lake Louise. The rest of our lodging has to be more economical but we don't want to stay in a hostel. We are looking into cabins around Jasper and Baniff. Unfortunately, this is a family trip so we don't have anyone to split expenses with. I guarantee that you'll have an incredible time. It's really beautiful country. If you are staying at Lake Louise, I highly recommend making the short drive up to Moraine Lake. I didn't see many lodging options on the main road driving towards Jasper but guessing you'll find more looking online. Thanks, I will check that website out. I've got 3 suggestions for hikes in this area which you might find helpful. I've got trip reports written on all of them. And they were all fantastic. But there are many more options. 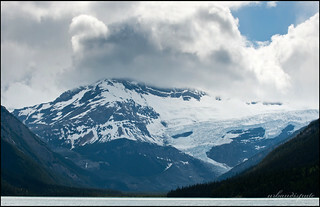 The hikes are: Plain of Six Glaciers, Bow Glacier Falls, and the Berg Lake Trail in Mount Robson. Thanks for the recommendations. We are looking for day hikes for this trip, so the first two look excellent. You mention preparing for bear issues. What did you do to prepare? I purchased some Bear Spray from the large hotel's sporting shop which is at Lake Louise. We just carried that with us everywhere. One other really good hike which I researched but didn't carry out was Sentinel Pass out of nearby Moraine Lake. That hike sometimes requires groups of four due to the bear activity. If you don't have four, there is a sign where you must stop and wait at for some more people to come. That is an interesting requirement. I've never heard of anything like that before. ALMOST without exception, grizzly bears won't charge big groups. Although there is a documented case somewhat recently in Alaska where a brown bear bluff charged a rather large group on a beach before turning off. It was considered highly unusual. Good to know that bear spray may be available at the hotel. Actually, I was thinking of asking the front desk if they have any. I bet a lot of visitors leave their's behind before they get on the airplane. If they are selling, it may not be available for free. The Sentinel Pass hike sounds like another winner. Five stars on trip advisor, even. Edited 1 time(s). Last edit at 03/31/2015 10:21AM by hikerchick395. More great suggestions. Thank you. I've added all of them to my plan. If the weather is good, I should be able to visit all of these places!